Prik Pao (or "namprik pao") is legendary in Thailand and has been a staple in Thai households for generations. 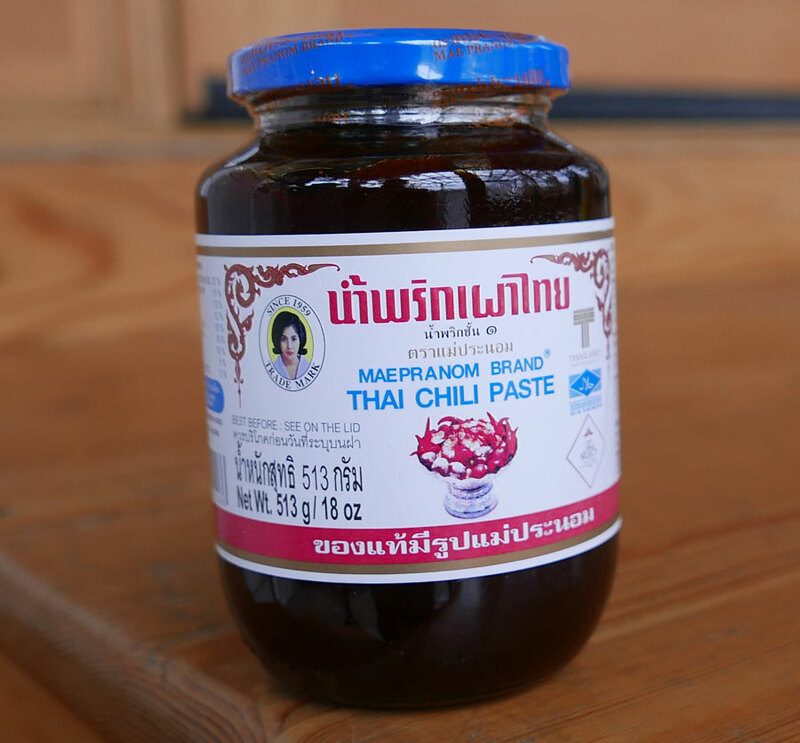 This is a cooked chile paste with a variety of uses, and it's the key ingredient in tom yum. Now offering in the large 16 oz jar. For a quick and delicous spicy meal, simply set one tablespoon prik pao in a small dish. Next to that, a bowl of steamed jasmine rice. Now put a little steamed vegetable on top of the rice, add a dab of prik pao, and take a bite. Wonderful flavor. You can add Prik Pao to any soup or noodles, even use it as a spicy sandwich spread. Mae Pranom is probably the tastiest brand of prik pao, but we also offer popular Pantai brand in the 16 oz jar. Ingredients: 20% vegetable oil, 15% dried shrimp, 10% dried chile, 10% onion, 10% garlic, 10% tamarind, 10% sugar, 10% salt, 5% shrimp paste. All Natural. Product of Thailand. Packed in a big glass jar with attractive label, Mae Pranom is a large producer employing the highest quality standard, and we also offer sweet chile dipping sauce in the same brand. NEW: We Also Offer Mae Pranom Yellow Label Prik Pao. Prik Pao used extensively in our Thai Street Vendor Video Series. NEW: See our video feature on how Prik Pao is made by hand. This recipe is from our own kitchen, not something you would typically find in Thailand, so we indexed it in our "Thai-American" section. Lately chefs in Thailand are combining ingredients to come up with creative dishes though, so it wouldn't surprise us to find something like this.